As if making games isn't hard enough, says People Can Fly's Lead Gameplay Designer Ed Kay, sometimes the companies you work for make you stand up in front of a crowd of French journalists and give a presentation. And that's when things get really interesting. As gamers, we fetishize the life of game designers. We imagine them kicking back in lavishly-decorated offices, drinking free sodas and driving expensive cars. And while it's true that a lot of game developers do these things, what we rarely see or imagine are the hours of grueling work they pour into making the videogames we enjoy for an hour or two and toss away, or the nights of sleep they lose, the days of seeing their families they miss out on or the months they spend agonizing over schedules and milestones and software builds that seem endlessly out of control. Designing games is tough work, in other words. But we know this. What we don't know, however, is that the work of promoting those games is just as hard. Harder perhaps. 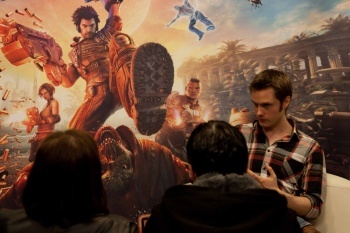 As Ed Kay discovered when he was shanghaied by his coworkers into attending a Paris press event to promote Bulletstorm. "I met with a bunch of extremely friendly Microsoft guys who then showed me the room where I'd be doing the presentation," he writes in a post at the People Can Fly blog. "Wait a minute ... presentation?" What ensues is a chaotic adventure involving jittery Xboxes, language barriers and ad-libbed demonstrations as Kay basically makes up the presentation on the spot and has to perform it again and again to a roomful of expectant journalists. But first I had to decide what part of the game to show. I needed to choose a section the journalists were not going to get to when playing the game on arriving, but also a section that hadn't been shown in any previous demos or interviews. So I chose the end of the Dam level since it had some great combat, a lot of weapons unlocked and a really dramatic finale. But then the next problem raised its deformed mutant head. We had absolutely no way of skipping to the Dam level. Since we only had a retail version of the game, our only option was to play through to that section, which was about four hours in. And the first presentation was due in three and a half hours - gulp! There was no time to think - we booted up the game, slapped it on ultra easy mode and attacked it like rabid animals. The entire post reads like a slapstick comedy of errors and should help to demystify the seemingly romantic life of an ordinary game developer. Whether or not that's a good thing depends, I guess, on how you like your heroes. I, for one, like mine honest and insightful and can't wait to see more from the folks at People Can Fly - both in game and out.